SNEAK PEEK: Waitress Cast Performs 'Opening Up', 'It Only Takes a Taste', and more! 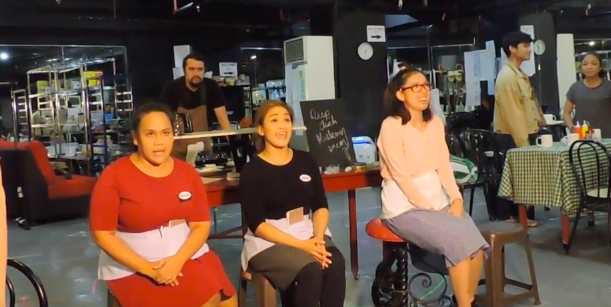 The cast and creative team of Atlantis Theatrical’s Waitress gave the press a sneak peek of the production during their rehearsals yesterday. Featuring the music and lyrics of Sara Bareilles, Waitress tells the story of pie maker Jenna who, despite the mundanity of her life, finds comfort and reckoning in the simple magic of baking. With the help of her two friends Dawn and Becky, she dreams of a way out of her loveless marriage and musters the courage to change her life for the better. Other members of the cast include Steven Conde as pie diner owner Joe, George Schulze as Jenna’s abusive husband Earl, and Dean Rosen as chef Cal. Completing the cast of Waitress are Sarah Facuri, Emeline Celis Guinid, Jillian Ita-as, Gerhard Krysstopher, Luis Marcelo, Luigi Quesada, and Teetin Villanueva. The show is directed by Bobby Garcia. 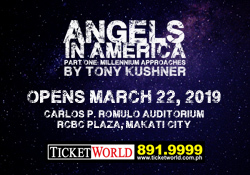 Members of the creative team also include Farley Asuncion (musical direction), David Gallo (set design), Cecile Martinez (choreography), Raven Ong (costume design), Aaron Porter (lighting design), Josh Millican (sound design), Manman Angsico (vocal coaching), and Johann dela Fuente (hair and make-up design). You can find excerpts from the performances in the video below. The show will run from November 9 to December 2 at the Carlos P. Romulo Auditorium of RCBC Plaza. Previous SNEAK PEEK: New Mula sa Buwan Cast Sings 'Ikaw', 'Ang Sabi Nila', and more!